Bentley today released this teaser photo of its first biofuel-powered car, set to debut at the Geneva auto show in March. 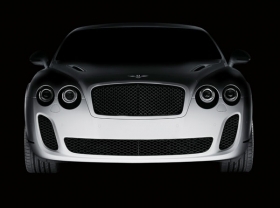 Besides holding the distinction of the fastest, most powerful Bentley ever, the new model marks stage one of Bentleys commitment to offer a full range of bioethanol-compatible vehicles by 2012. Biofuels are key to Bentleys environmental strategy announced in February 2008. That strategy also calls for reducing carbon emissions across the Bentley lineup by at least 15 percent before 2012 and introducing a new powertrain that reduces fuel consumption by 40 percent. Stuart McCollough, Bentley board member for sales and marketing, said the biofuel car debuting in Geneva is proof that Bentley is on track to meet its goals. Speaking to Automotive News at the Detroit auto show last month, McCollough said biofuel is a promising technology that has gotten a bum rap in some parts of the world. To that end, Bentley last month began distributing a report that reiterates its belief that bioethanol can become a sustainable, ethical alternative to fossil fuels. Titled Bentley and the Future of Biofuels, the report calls on cooperation between governments, biofuel producers, non-government organizations and automakers.